Making a will is an important, if unfortunate, part of many people’s lives. But if you haven’t made a will fear not, for you are certainly not alone. It has been reported that Prince Rogers Nelson, a man more commonly known as Prince, had not made a will at the time of his death. According to documents filed after his death by his sister, Prince died intestate (ie without a will). His sister was therefore forced to request the appointment of a special executor to administer the will. Prince is certainly not unique in this respect. It is estimated that 3 out of 4 Irish people do not have a will and though writing a will is no guarantee of avoiding distasteful family rows in the event of a loved one’s death – after all, where there is a will there is likely to be a war – there are certain practical reasons why writing a will is beneficial. Solicitor Ollie Shannon says that it is far more cost effective to write a will rather than endure the unpleasant and time consuming legal disputes which can often arise when someone dies intestate. If a person dies intestate then the provisions of the Succession Act 1965 will apply. For example, if a married person with no children dies without leaving a will, then the spouse of the deceased will automatically be entitled to the entire estate. If a married person with two children dies, then the spouse will be entitled to two thirds of the estate and the remaining third will be split between the two children. If an unmarried person with no children dies, then his or her parents will be entitled to the estate. If predeceased by his or her parents, the estate of the deceased will be split between siblings, nieces, nephews and so on down the line of familial succession. Even if the rules of succession appear attractive there are other reasons to consider writing a will. 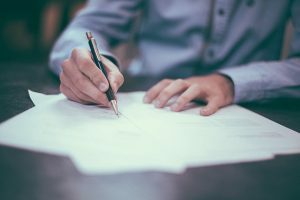 If a will is written, then the testator (the person who makes the will) can appoint a trustworthy executor to ensure that his or her affairs are in order. The executor can administer the will in an efficient, sensible and cost effective manner. A will can provide security for a deceased’s children and the executor can ensure that trusts which are set up for the benefit of children are dealt with in a manner which is beneficial to them. Setting up a will can also ensure that tax liabilities which might be incurred by beneficiaries of the will are avoided. Children are entitled to tax free gifts of up to €280,000 but other beneficiaries are only entitled to tax free gifts of over €30,000. If a gift is larger than that amount, it will then be taxed at a rate of 33%. A solicitor can explain to you how these charges can be avoided and how the fee for creating a will is far cheaper than the legal costs which will arise as a result of intestacy. Contact Ollie Shannon for advice on writing your will.